The RFS service provides an opportunity for U.S. public companies1 to express their differences of opinion with Glass Lewis’ analysis on proxy proposals (e.g., Say on Pay proposal) to be voted on at their annual meeting. 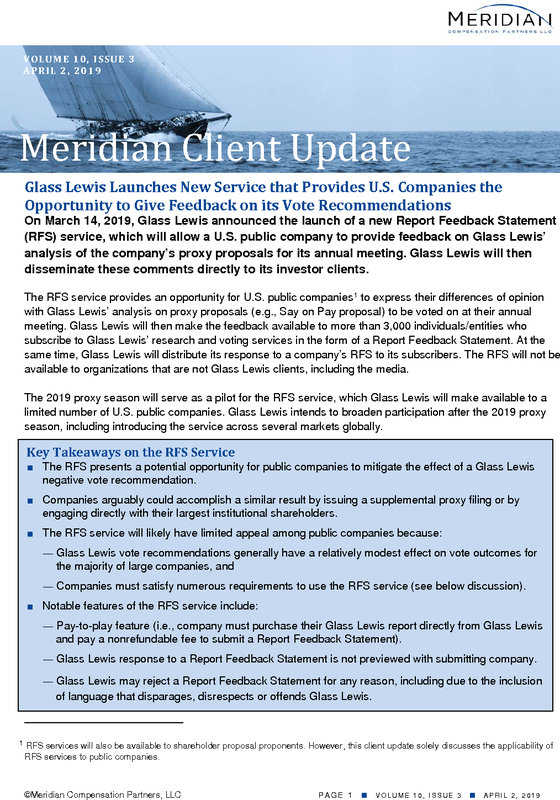 Glass Lewis will then make the feedback available to more than 3,000 individuals/entities who subscribe to Glass Lewis’ research and voting services in the form of a Report Feedback Statement. At the same time, Glass Lewis will distribute its response to a company’s RFS to its subscribers. The RFS will not be available to organizations that are not Glass Lewis clients, including the media. The 2019 proxy season will serve as a pilot for the RFS service, which Glass Lewis will make available to a limited number of U.S. public companies. Glass Lewis intends to broaden participation after the 2019 proxy season, including introducing the service across several markets globally. What is the deadline for submitting an RFS? A company must submit a Report Feedback Statement within four business days following Glass Lewis’ publication of the company’s Proxy Paper report. Additionally, at least 30 days before its annual meeting, a company must enroll in Glass Lewis’ free Issuer Data Report (IDR) program and complete the IDR within two days of publication of the Glass Lewis Proxy Paper report. The IDR program provides a company the opportunity to correct errors found in some of the data that Glass Lewis includes in its company report. Is there a cost to participate in the RFS service? A company must purchase its Glass Lewis report in advance of submitting an RFS. The fee to purchase the Glass Lewis report is nonrefundable, even if a company decides not to submit an RFS. Are there limits to the number of U.S. public companies that may participate in the pilot RFS service? Yes. Under the pilot program from March through May 2019, Glass Lewis will cap the number of U.S. public companies that may participate in the RFS service at a maximum of 12 companies and/or shareholder proponents per week. The weekly cap is subject to change depending on the length and complexity of the statements received for any week. Are there specific requirements that an RFS must satisfy? ― be signed by an executive who is an authorized representative of the submitting company, with the authority to issue external statements on behalf of the company. ― execute the RFS terms and conditions. Glass Lewis also reserves the right, in its sole discretion, to accept or reject an RFS for any reason. Will Glass Lewis issue a response to a company’s RFS? Yes. Glass Lewis will develop a response to comments and issues raised in a company’s RFS. Glass Lewis presents to investor clients both the RFS and its response to the statement. However, Glass Lewis will not preview its response to companies that submit Report Feedback Statements. Although the RFS service does not allow public companies to engage Glass Lewis, the service provides public companies an outlet to respond to Glass Lewis vote recommendations and potentially persuade investors to support their proxy proposals. However, Glass Lewis will have the final word regarding any company feedback. Many companies may find this feature unappealing, along with the lengthy list of requirements that must be satisfied for participation in the RFS service. ■ In the current proxy year, Glass Lewis has issued an adverse vote recommendation on one or more management proposals and management believes such vote recommendation is inappropriate and will likely depress favorable votes on the proposal. ■ Management believes that submitting a Report Feedback Statement is the best and most efficient manner in which to rebut an adverse Glass Lewis vote recommendation. As an alternative to using the RFS service, we anticipate companies that choose to respond to an adverse vote recommendation from Glass Lewis and/or ISS will continue to do so through a supplemental proxy filing or by engaging directly with their largest institutional shareholders. The RFS service is part of a broader evolution of Glass Lewis’ interactions with public companies, which include its direct engagement with companies outside of the proxy solicitation period, its IDR program and its portal for reporting errors and inaccuracies in its reports. 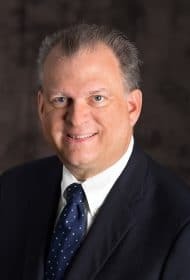 Glass Lewis seems to be trying to counter some of the criticisms that public companies and business organizations have raised about proxy advisory firms at a time when regulation of the proxy advisory firms appears imminent. However, Glass Lewis’ recent initiatives are unlikely to ameliorate concerns of companies and regulators about the role and influence of proxy advisory firms. 1 RFS services will also be available to shareholder proposal proponents. However, this client update solely discusses the applicability of RFS services to public companies. 2 A company’s “solicitation period” begins on the date the company sends notice of its annual meeting to shareholders and ends on the date of the meeting.